When it is about displaying your business online or marketing your business online just by showing images of your products and services is not enough. Along with the images written contents is a must. For people to have a better understanding about your products and services it is important that you give a detailed description in written. However, just by writing content is not enough to draw the attention of your customers and increase traffic. There are certain strategies that need to be prepared well before hand. 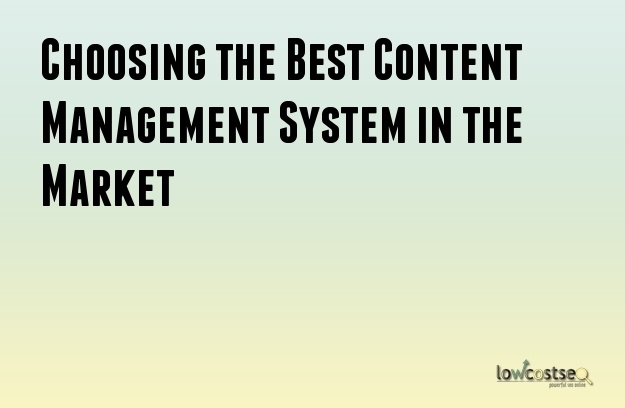 The best way to forecast your business is by using a content management system or CMS. So, how does CMS help? This is a place where content is created or prepared. An established content management system will make use of advanced tools which makes content writing easier. Various macros and widgets can be created for automated repeated actions or applications with defined purposes. There are various collaboration tools that can be included in a content management system. These tools can help a team to work together on a specific content. CMS helps to keep a track of every person who is making an access to the content and also the changes made in the content. This makes it easier for people to work simultaneously without hampering everyone’s contribution to the content. After this, an administrator can go through changes that have been made in the content and discard what is not necessary. The modern days systems should be able to tag the contents. Such tagging can be generic and very light or it can also be very granular and deep which helps in capturing lots of details regarding the content and help in formalizing metadata. Most of the CMS system that is available these days offers normal XML tagging. These XML tagging are quite flexible to translate varied other tagsets, even HTML is included. However, these days there are various content management systems or CMS available in the market. Again, it is important to be careful as not all content management systems are efficient enough for managing websites. There are basically three most renowned websites that are available like joomla, Drupal, and WordPress. So, why are they the best and on what basis are they the best? Here is a detailed description about the popularity of these websites. WordPress manages near about 70 million websites in their content management system. Drupal content management system manages near about 800 thousand websites from across the globe. Now, if you take into consideration joomla than currently it is managing near about 3 million websites. When it is hiring a company we always think of hiring the most reputed. In the same way, when it is about hiring a CMS company you should only choose the best from the lot. Thus, among all the CMS companies that are available in the market WordPress has got the majority of the shares after which joomla is on the second spot in terms of its market share followed by Drupal.